Every year the youth at my church hold an auction to help pay for a youth conference that they have during the summer. All kinds of things get donated such as piano lessons, rides to the airport, homemade cookies, babysitting, etc. Last year I donated this quilt. 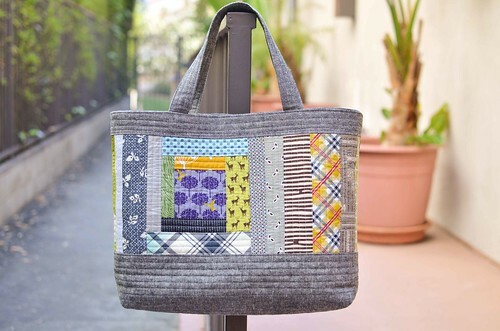 I didn't have time to do a quilt this year, but I still wanted to contribute, so I decided to make a tote using Elizabeth Hartman's fantastic pattern. 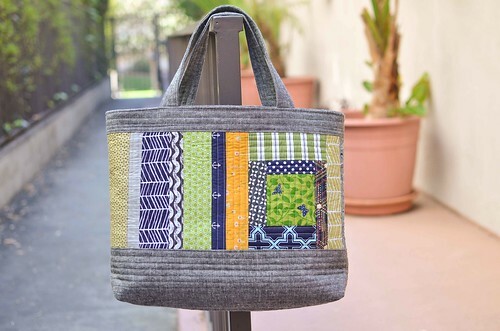 I have made a couple of the tall totes for my daughter's teachers and a shrunk the pattern down to make a couple for my kids but I haven't made the wide version of the tote until now. I used a square from an Echino cheater print for the center of each side and then used blues, greens, yellows, and neutrals from my scrap bin. I didn't have enough Kona navy for the lining, so I used a Chicopee print for the lining and the navy solid for the pockets. I really enjoy this pattern because even though it takes a little bit of time to put together, it feels like I am making something different each time. I just need to make one for myself now! This will be an awesome addition to the auction! LOVE it! such pretty fabric, lots of interest. That tote has such a great balanced proportion. Your fabric choices are spot on. Ok I love this. 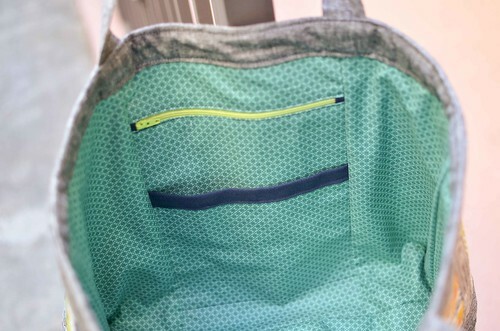 Off to buy the pattern so I can make my own, I love the idea of yard-dyed essex linen for this tote! Beautiful job! This makes me want one too!